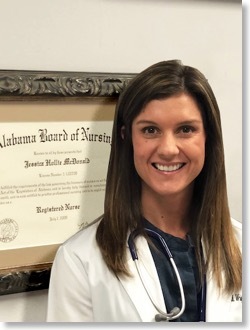 Jessica Wright is an Adult Primary Care Nurse Practitioner licensed by the Alabama Board of Nursing and certified by the American Academy of Nurse Practitioners. She graduated with a bachelor's degree in Psychology from Auburn University in 2008. Shortly after, She completed her Bachelor of Nursing at the University of Alabama at Birmingham (UAB) in 2009. While working as a registered nurse at UAB, Jessica completed her master's degree nursing (2011). In addition to her clinical experience, Jessica has a diverse background as a nurse practitioner. Prior to joining the Sleep Disorders Center, she worked in primary/urgent care where she treated a myriad of acute and chronic medical conditions. She also has experience with patients who suffer from chronic pain. Jessica focuses on building trusting relationships and effective communication to better educate her patients on their health conditions. She hopes educating patients will empower them to live healthier lives believing that improvement in function and quality of life are the best outcome measures when treating patients with chronic disease. She recognizes the significance of untreated medical conditions and the impact it can have on quality of life. Jessica hopes to restore her patients' faith in healthcare through a comprehensive and individualized approach with each patient. In her spare time, Jessica enjoys spending time with her husband, their two children and dog. Her hobbies include traveling, cooking, spending time with friends and family, and exercising. Our center performs Research Studies and Clinical Trials to help determine the effective-ness of new drugs and treat-ments. For more information, check Clinical Trials and Disorders on main menu at top. 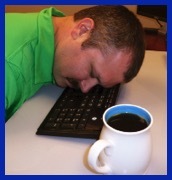 If you use CPAP . . . Please be aware that CPAP equipment wears out. You should consider replacing your mask, headgear and hoses about every 6 months. Please CLICK HERE to navigate this site. Our drop down menus may not work with Android, but work fine with Apple's iOS on iPad/iPhone/iPod.